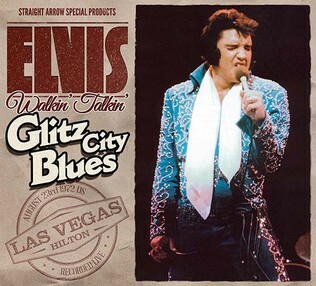 A Straight Arrow release titled "WALKIN‘ TALKIN‘ GLITZ CITY BLUES", featuring the August 23rd, 1972 Dinner show. It is taken from an original mono audience recording in remarkably good sound. Yes, we used the original actual cassette that was used to record this concert in the first place, and we were able to improve the sound-quality noticeably. It’s unlikely that anyone who saw Elvis Presley on stage during the Summer ’72 engagement came away disappointed. Presley looked fabulous: he had a nice tan, he was slim, and both the jumpsuit and the jacket / pants combinations that he was experimenting with looked rather good on him. His shows that season were tight and highly professional, and truly offered something for everybody. The setlist was largely based on the MSG one, with new additions like ‘What Now My Love’ and ‘My Way’ adding extra spice to the show. The dinner show from August 23rd, 1972 is a topnotch performance. He’s right in the middle of the engagement, with still about two weeks left, but he delivers the goods and puts his soul especially into the power ballads. It’s not unlikely that he may have wanted to impress journalist Joe Delaney, a reviewer for the Las Vegas Sun and an old friend of the Colonel’s, who was in the audience that night. It should be noted that the August 23, 1972 Dinner show is completely new, even for die-hard Elvis fans. This concert has never been in circulation in any form. Unfortunately the tape ran out before the finale of „My Way“. The producers decided to use (great sounding) original tapes of the August 22nd, 1972 M/S and the August 23rd, 1972 M/S from their vaults, to fill out the missing part.